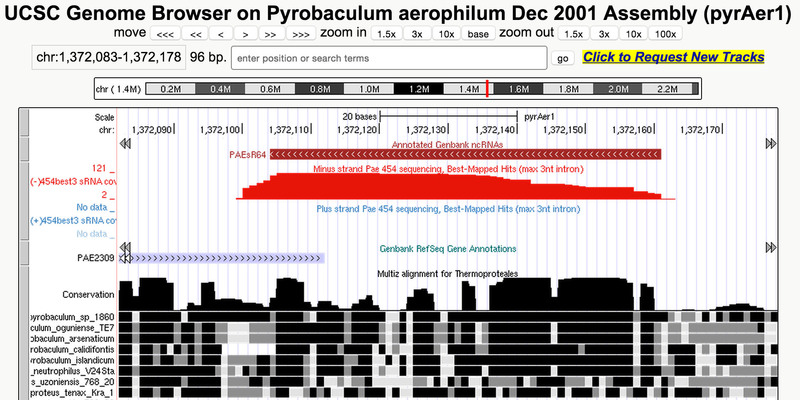 Small RNA sequencing data and annotations for Pyrobaculum C/D box sRNAs can be viewed as wiggle and bed tracks in the UCSC Microbial Genome Browser. Wiggle tracks of transcriptome data display the data as coverage, rather than individual reads. Bed tracks of C/D box sRNA data use exon/intron notation to show box features. Track hubs are web-accessible directories of genomic data that can be viewed on the UCSC Genome Browser. For this track hub, you will load (1) wiggle tracks of small RNA sequencing data for P. aerophilum, P. arsenaticum, P. calidifontis, P. islandicum, P. oguniense and (2) bed tracks of the C/D box sRNA annotations for these Pyrobaculum and P. neutrophilum . Go to the Microbial genome browser and pick a species. On the gateway page for a species, click on "Track Hubs." You can find the gateway page for Pyrobaculum aerophilum here. If you cannot see the track hub, scroll down and make sure that the visiblity of the track ("Pyrobaculum Small RNA-seq") is not on "hide." Make sure that the C/D box sRNA track is on "full" visibility to see arrows that indicate which strand the annotations are on. To modify viewing settings, including scaling, click on the grey bar on the left of the track.